With the model refinement of the A-Class and B-Class, Active Park Assist, code (235), is available as special equipment for the first time and the PARKTRONIC (PTS) system is included additionally. Like the familiar PARKTRONIC system, Active Park Assist operates using ultrasonic sensors. Active Park Assist helps the driver to find a sufficiently large parallel parking space and then park the vehicle comfortably in the space. Ultrasonic sensors are used to scan the road for parallel parking spaces, which are then suggested to the driver. Once a parking space has been found, the system controls the steering maneuver by actuating the electric steering actuator. The driver remains responsible for determining the acceptability/plausibility of the parking space found by the system and also controls the longitudinal movement of the vehicle via the accelerator pedal and brake pedal. 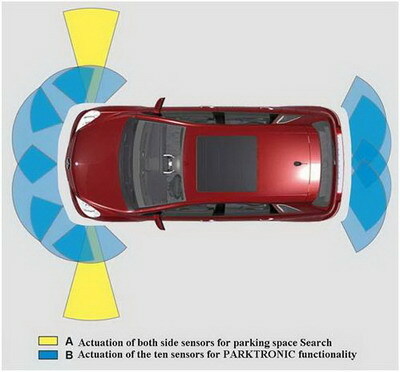 On vehicles with Active Park Assist, the outer left and right front ultrasonic sensors are not just used for the PARKTRONIC function, they also scan the road for potential parallel parking spaces. 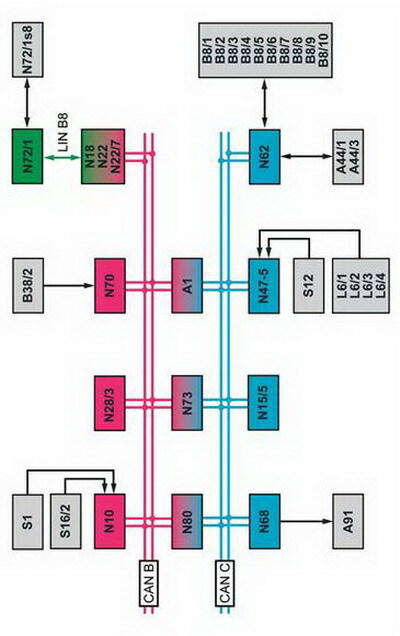 The two outer sensors therefore change their sensing range according to requirements. The Active Park Assist function does not have to be activated. 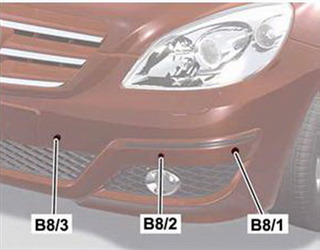 At vehicle speeds of up to 35 km/h, the outer ultrasonic sensors in the front bumper always operate in the background to scan the road for parking spaces on both sides, to the left and right of the vehicle. The parking spaces that are found are stored over a distance of approx. 15 m.
At low speeds, the symbol "P" is displayed on the multifunction display of the instrument cluster to indicate that the system is searching for parking spaces. When a parking space is found, an arrow indicates the side of the road on which the parking space is located. By default the system only indicates parking spaces on the passenger-side of the vehicle. To have parking spaces on the driver side indicated as well (e.g. on one-way streets), the driver must actuate the turn signal towards the driver side. The space must be parallel to the road, must be at least 1.3 m longer than the vehicle, may not be longer than 10 m and must be at least 1.5 m wide. The system only detects free spaces based on whether the vehicle would fit in the space. It cannot detect whether or not the free space is actually a parking space. "Pay attention to your surroundings"
The parking maneuver supported by the Active Park Assist function is started once the system warning messages have been confirmed on the instrument cluster. The driver now removes his/her hands from the steering wheel and only has to carefully actuate the accelerator and brake pedals until the final position is reached. Additional maneuvering may be required. The Active Park Assist function is aborted if the vehicle speed exceeds 10 km/h during parking or if the driver intervenes in the steering maneuver while the vehicle is being parked. The lateral boundary of the parking space (width) is determined based on a detected obstacle (e.g. a curb). If no obstacle is detected at the side, the vehicle is aligned based on the obstacle in front (vehicle). In this case, the parking angle is determined by the direction of travel as the vehicle moved past the parking space. • "Please engage forward gear"
• "Please engage reverse gear"